Japan’s Panasonic Corp, best known for its television sets and home theater systems, wants to feed Singaporeans its radishes and lettuce. 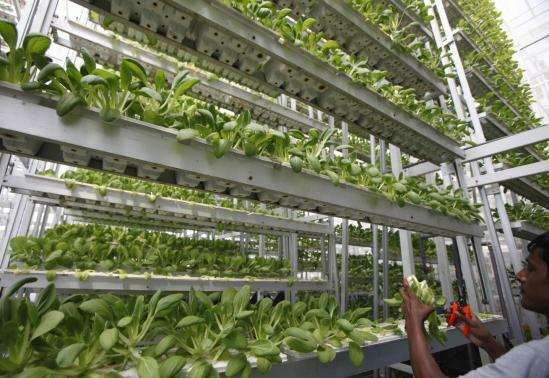 A unit of the electronics conglomerate last week started selling to a chain of Japanese restaurants in Singapore fresh produce grown in what it says is the first licensed indoor vegetable farm in the island state. The move ties Panasonic’s deeper push into farming technology with land-scarce Singapore’s ambition to reduce its near-total reliance on food imports. 1. The concept of indoor farming is not new. What is new is the urgent need to scale up this technology. Why do we need indoor farming? 2. Indoor farming has found favor with other hi-tech Japanese companies as well like Fujitsu and Sharp.